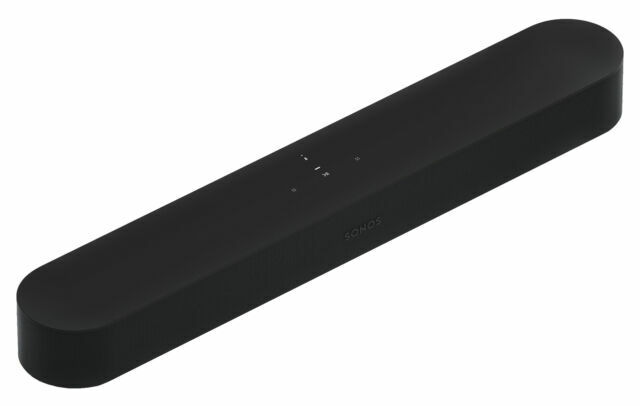 Sonos Beam Wireless Soundbar Speaker - Black. Condition is New. The Beam is a well made soundbar for small rooms, ideal for the bedroom. The HDMI ARC connection is a big plus. The soundbar needs bass and the subwoofer is really expensive, so that is the only con I can see. But it is a well built sound bar that has excellent sound and voice clarity. It wont bounce you out of your room but you wont be sorry and you will save $300 not buying the bigger one. Buy it and enjoy. Love the integration with Alexa also. Really enjoy the system, keep adding components to it. Having each component powered adds a zest and liveliness to the system that u are lacking in passively powered systems. Used to be that this would have been an excessively noisy system, but they've engineered that out, it is quiet where it is supposed to be. I'm a fan, luv the zest and responsiveness of this system. Entry into Sonos, this is it! My first speaker bar, the sound is amazing. Integration with Alexa is pretty nice too, I have spotify so it's a really good smart speaker for playing music. Definitely recommend this for entry into the Sonos environment. Easy easy easy! Easy to install Easy to order Easy to enjoy Best purchase of 2019 I’ve made yet!